flower ,rmv iii- in the Republic. fore published, included in this story. 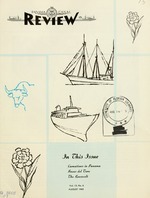 Panama Canal Information O tft, ir Published quarterly at Balboa Heights, C.Z. Printed at the Printing Plant, La Boca, C.Z. further clearance. Credit to the Review will be appreciated. Distributed free of charge to all Panama Canal Employees. Almirante in honor of Columbus. es for miles on the island of Bocas del Toro. moted several package tours to the city. investors in building modern hotels. rudimentary, but very nmxltustl priced. doubles are priced at S2 50. Water sports are the main attraction. Skin and scuba diving are popular in Bocas. until his departure from Bocas. Cocoqui, later renamed San Cristobal. settled on the island of Bastimentos. priest who is said to have seen a vision there. rante, on the mainland across from the plantations. made, and these are delicious." \\' i e are you?" asked Captain Rice. One talk given by Captain and Mrs.
CQ CQ C lling Florida. Another airwaves class is about to come to order. Mrs. Rice. The pupils are thousands of miles away. the transit," he chuckles proudly. talk you gave us on the Panama Canal. Beverly, 6, came complete with U.S.
citizenship. She was born in St. Louis. of the day. Nor does he think anything mother. Colonel Parfitt, and Mrs. Parfitt. and locales last seen under enemy fire. and lick it, you are seeing a rockhound. Isthmus good places for a rock hunt. the hobby of the pick and sack. were used by Loretta Merrill to create "rock painting." make up the earth's pebbles and stones. smooth and waxy chalcedony stones. in operation during rockhounds' exhibit. mixture of sealing wax and lacquer). the cold causes the stone to drop off. The stone is then ready to mount. and polishing stones is called tumbling. detergent for 2 or 3 days. j".llk, the last step has arrived! stones he picked up at the beach. turn out to to be too course in texture. made by Mrs. Robert Merrill, of Balboa. device that he made for a few dollars. mounted on gold plated findings. into a large industry in Panama. in the right amount of sunlight. Air circulation is also controlled. nation was chosen to launch the project. David. \ ith care, these prospered. are pushed to full development. a few is sometimes hard to determine. and others show a lot of promise. Panama is ideal in terms of location. are selected, producing a superior product under the best conditions. ning to millions of flowers annually. East coast of United States and Far East ---------. All other routes ..-- ---- --. .
Total Ir .li.ff .. .___. -. motel near St. Petersburg, Fla.
tel owned by Mr. and Mrs. Thomas J.
fish will be the primary goal. Hospital, some in the United States. and Mr. Enrique Diaz, of Colombia. will permit her to cruise at 21 knots. a highly efficient built-in system. ships, 32 of which are company owned. & McKay are the local agents. most unusual 19,000-ton ship afloat. Tankers is Stolt-Nielsen Chartering, Inc.
the ship is Fernie & Co.
Bauxite _.._- _____ __---___--- . Vessels under 300 net tons or 500 displacement tons. overcome the hazards of arctic travel. exploration of the North Pole. and between fields of ice. Background photo on this page shows the Roosevelt locked in polar ice at Cape Sheridan. to fight massive concentrations of ice. in a hut on the west Greenland shore. on the trip, 1 dog was brought back. In ice-filled waters is the Roosevelt, just after she was launched at Bucksport, Maine. it all to preparation for the final assault. tic Club and put up money for the ship. that club, Morris K. Jesup "
of champagne encased in a block of ice. steel plating 6 feet wide. 28 more years of work and adventure. President Theodore Roosevelt meets members of the crew during a visit aboard the ship bearing his name. U.S. Bureau of Fisheries for $40,000. ama Canal upon completion of refitting. The Roosevelt in Balboa drydock in 1917.
the middle 1930's, the sister ship to the Raffaelo was launched in September 1962. The ultramodern Oceanic will transit the Canal early next year. Caribbean cruise out of New York. the ship was delivered to her owners earlier this year. travel and has a range of 10,900 miles at a speed of 25 knots. 1,200 cruise p.i,,. ni' is. doors and can be converted into rooms with a sitting room. chapel, and a 1,200-square foot gymnasium. by two swimming pools, a solarium, bar, and restaurants. jets of water to add color on gala nights. circulation on board of a full-scale newspaper. "I couldn't do .i.. tllinll else," he says. I took up talking on the radio." where guard rails are nonexistent. she likes to experiment with new dishes. Institute of Technology in 1948.
and he plans to do just that in his walks. pital provided with modern equipment. built for the White Star Line in 1899. Europe to the United States. from the United States back to Europe. is 6 hours and 4 hours, respectively. or taken off by fork lift trucks. Sof cars awaits loading on the Dyvi Atlantic. *Cargo figures are in long tons. of the steel gate was completed. House desk of Woodrow Wilson. the waterway for 4 days. to the Red Cross for War Relief. the tale was not discovered. tury of service to ships of the world. Anniversary of this world wonder. foos. Also leaving the Zone was Col.
Robert J. Kamish, Health Director. Replacing Colonel Kamish was Col.
a place is the Administration Building at Balboa Heights. Above is an unusual (for the times) photograph taken on a night in June 1915. Note the tiny palm trees, under each row of lights, which have grown into the dominating beauties of the Prado today. docked 3 weeks for further repairs. aboard, might have lasted another week. Seattle. Unalaska, and the Pribilofs, St.
boa bh the P n..n t, Canal tug U.S.
that. It was the worst I ever saw." was sold to the California Towing Co.
in L her captain that the end was near. decided to return to Cristobal. Jason, under tow of the Roosevelt." her career and, like Peary, she knew. A gallant effort was made by Mrs. The Roosevelt ended its brilliant career on the salt mud flats of Cristobal harbor. a giant condor, it proclaims Bolivar the "Liberator of America." year since 1891. He spent his own money and his wife gave hers. The U.S. Navy put him on leave for e.xplorations but the problems were his to solve. He gave much of his health before he began his last trip; his life had been one long fight against misfortune in the far north. In 1891 he broke his leg on the first expedition. In 1893, on a second trip, the Peary baby (now Marie Peary Stafford of Brunswick, Maine) was born in a hut on the west Greenland shore. Weather turned back the exploration the following spring. In 189.5 Peary struck out again across the icecap. Lack of food cut the journey short and starvation nearly overtook the expedition. The men were saved by eating their dogs. Of 40 taken on the trip, 1 dog was brought back. In 1896 Peary's attempt to bring back the great meteorite at Cape York was beaten back by storm and heavy ice. The next year he succeeded and brought the meteorite to New York by ship. In 1898 he made another assault on the Pole. A blizzard caught the men on the torturous march and Peary nearly froze. Seven of his toes had to be amputated in an operation under primitive conditions. He lay helpless for 6 weeks in a deserted station at Fort Conger, then was dragged south on a sledge for 2.50 miles in a temperature of 50 below zero. In 1900 he was finally well enough to start again and he headed for the Pole. Open ice fields proved too dangerous and forced him back. He tried again the next year and the same hazard turned him back. In 1902 he planned a 60-day expedition to the Pole and started out with 60 dogs, tons of walrus meat and 8 or 10 Eskimoes. Again, the elements defeated the thrust. But Peary gained a hard-won fund of knowledge. His experience and failIn ice-filled waters is the Roosevelt, just after she was launched at Bucksport, Maine. Adm. Robert E. Peary The Panama Canal Re\ievv 15 ures were not wasted; he would apply it all to preparation for the final assault. And, of course, he now had the support of a group of men whose belief in him led them to form the Peary Arctic Club and put up money for the ship. The admiral was gratified, and he never claimed for himself all of the accolades that came afterwards; he insisted, for example, "This ship is not the Peary ship, but the ship of the Peary Arctic Club, and she is afloat due to the broad faith and courage of the president of that club, Morris K. Jesup ..." The mission of the rugged ship was seen by the club as "the sign of man's final physical conquest of the earth . enduring fame for this country. It means that we pluck and hold forever the last of the great world prizes for which adventurous nations have struggled." At the time, the Roosevelt was the wonder of the shipbuilding world. Built in Bucksport, Maine, it was christened by Peary's wife Josephine with a bottle of champagne encased in a block of ice. It was the first ship built in the Western Hemisphere for arctic exploration. It was not a big ship, generally speaking, but was the second largest ever to winter in the Arctic. Its rounded hull let it literally pop out of the ice if squeezed. Even if stood on end and gripped by ice, the strain would hardly be felt because the construction was so stout. Its light draft of 16 feet allowed operation close to shore. The thick sides were armor-plated to take the worst rub of passing ice. The bow had 1-inch steel plating from the keel up to to .3 feet above the waterline and extending for 10 feet. The stern protection, of like strength, reached from the keel above the \\aterline and extended forward for 14 feet. Waterline armor, extending between the bow and stern protection, was of %-inch steel plating 6 feet wide. The principle of power was reversed in the Roosevelt, when compared to other arctic ships. Sail power was primary in previous ships^ with steam as an auxiliary power. But the Roosevelt depended upon its steam engine, with a sailing rig as auxiliary, to give an extra push when good winds were about. Its engine gave it as much power as the most powerful oceangoing tug in New York Harbor. The propeller shaft was 12 inches thick. The propeller was 11 feet in diameter and furnished tremendous push. How the vessel came to be named is told by Peary: "For the ship by whose aid I hoped to fight my way toward the most inaccesible spot on earth, the name of Roosevelt seemed to be the one and inevitable. It held as an ideal before the expedition those very qualities of strength, insistence, persistence, and unvarying victory over all obstacles which made the 26th President of the United States so great." Peary and the Roosevelt returned triumphant from the North Pole in September 1909. She steamed into port flving the North Pole flag, "... a flag which never before had entered anv port in history." In 1909, after the Roosevelt's participation in the Hudson-Fulton Anniversary Celebration naval parade up the Hudson Ri\er, Peary and the Roosevelt parted company. Ahead of the ship lay 28 more years of work and adventure. Shortly after that Peary proposed that the Pearv Arctic Club and the National Geographic Society undertake a great Antarctic expedition, with the club donating the Roosevelt as its share Material for this stor>' was gathered by Julius Grigore, Jr., Assistant Chief of the Industrial Division, and it includes pictures from the personal album of Mrs. Marie Peary Stafford, Admiral Peary's daughter.